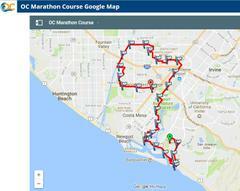 We'd like to remind you that this weekend you might experience traffic delays and street closures due to the OC Marathon.. Please note that Saturday evening is the Wahoo's OC 5K Run/Walk. Between about 4:00 p.m. to 7:00 p.m., Fairview Road between Fair Drive and Arlington Drive, as well as Merrimac Way between Harbor Boulevard and Fairview Road will be closed for the run, which circles through the Fairgrounds and crosses Fairview Drive and on to Merrimac Way.